The pink salmon (Oncorhynchus gorbuscha) is the smallest of Pacific salmon but the most prolific, averaging three to five pounds. They travel more than 150 miles in the ocean from their natal river, but they rarely travel far upriver to spawn. Pink salmon are also called "humpbacks" or "humpies" because spawning males develop a large hump on their backs. One unique feature of the pink salmon is that it’s the only species of the pacific salmon that migrate and spawn every other year or (in our area) even numbered years only. 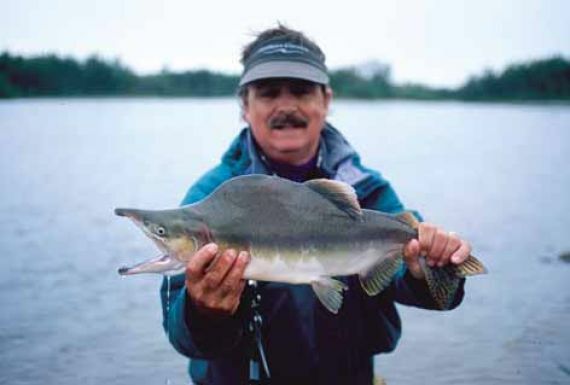 At the Royal Coachman Lodge, we have grown to love pink salmon years. The sheer number of fish that migrate up our river systems is certainly something to experience and see with your own eyes. During the peak of the pink salmon migration, we often use a float-plane to visually spot huge numbers of Alaska salmon migrating upriver. You can actually see thousands of these salmon from the air! Although we are mainly targeting Coho salmon, the pinks will keep your rod bent till the next school of fresh Silver salmon swim by. Our exclusive coastal fishery receives a small run of sea-lice pink salmon every year it seems. Fresh Alaska salmon of any species are remarkable fighters. Of all the pacific salmon, Mr. Pink has one of the most aggressive personalities. If you’re a patient angler you can temp these fish to rise to a surface fly! Ultimately, they love to eat hot colored streamers. So much so, it’s often fun trying to find a fly that they will NOT eat! You can create your first ever self-tied fly in the warmth of the Royal Coachman Lodge. Then sneak out after dinner and catch a Pink salmon on your very own creation from the dock! If you have a children that you want to get into fly fishing, i do not think their is a better species. The fishing action can definitely captivate even a 10 year olds short attention span!